Anyone who owns a boat knows that anything with the word “marine” associated with it commands a premium price. But did you know that a lot of the pieces and parts onboard are actually the same as the ones used in motor homes and travel trailers? It makes sense, since we tell people that our boat is basically an RV that floats to help them understand what it’s like to be a liveaboard cruiser. From water pumps and plumbing parts to locker latches and tank level gauges, power cables and hoses to LED lights and galley items, there’s a wide range of components that you can save a bundle on if you shop for them at your local RV store rather than at West Marine. For example, the Seaward Princess propane stove on our Hunter 376 was also used in motor homes. So when we went looking for a stove top cutting board (which Rhonda won’t let me under any circumstances do any cutting on! ), we found one at our local RV dealer for less than $40 that was custom made to fit. I might not be allowed to chop and slice on it, but it does really extend the counter surface while we’re doing prep and cleanup, and it just looks great. So if you haven’t tried it yet, take a run down to your local RV dealer and wander around their parts department for a while. I think you’ll be amazed at all the things you’ll see that you’ll recognize and/or could use onboard, and you’ll be pleasantly surprised at the cost compared to marine store pricing. This entry was posted in What?, Where? 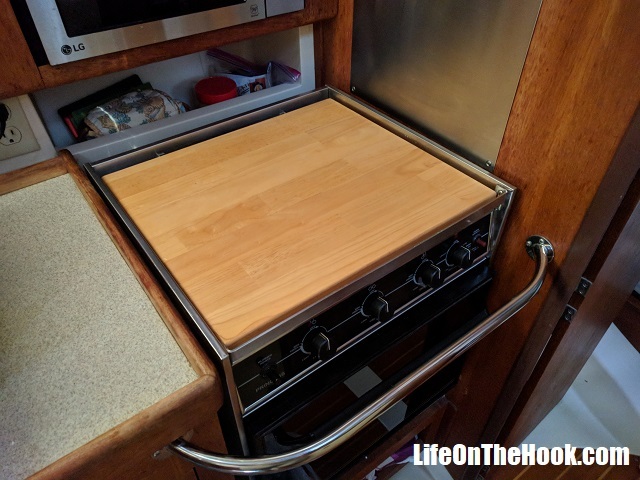 and tagged Buying marine parts at the RV store, Hunter 376 stove cutting board, Seaward Princess cutting board, Seaward Princess stove topper on August 6, 2018 by Robert. Robert/Rhonda- I’m 73 yrs young and recent owner of a Hunter376 in Puget Sound.I’ve enjoyed all your blogs and am still reading your older archives.I’ve learned a lot from you both regarding the 376 and am certainly grateful. I’m glad Robert is healing from the knee problems.Wishing you both smooth sailing in the future and keep the articles coming. Rick Bach/Seattle. Thanks Richard, and welcome aboard! As you’ll probably see in our archives, we lived in the Seattle area for quite a while and still have a strong connection. We’re glad you find the articles useful. We get a lot of satisfaction from helping other Hunter owners!